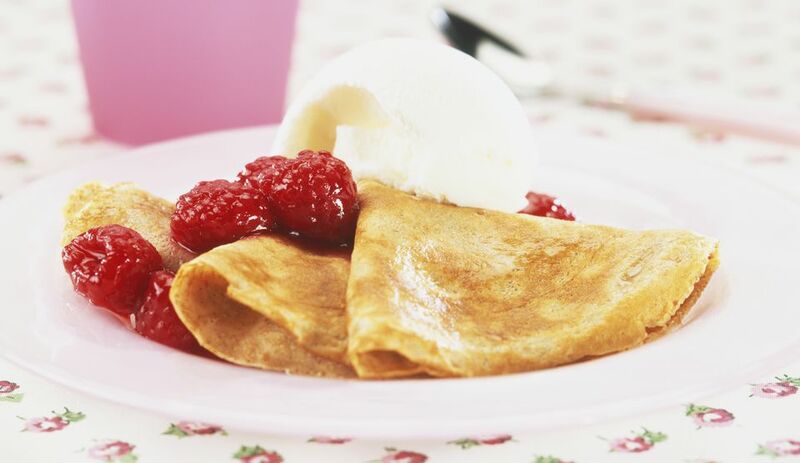 This fruity crepes recipe is a summery twist on the same variation of crepes used in upscale restaurants today,​ the Crepes Suzette, where a simple mix of butter, sugar and Grand Marnier are flambéed into a delicious syrup. The sauce is used to used to flavor a fresh, warm crepe. The variation in this recipe is the addition of fruits and ice cream bringing an entirely different dessert to the summer table. Both Crepes Suzette and this fruity alternative are traditionally served as a decadent dessert, but can be added to a brunch menu as a gorgeous showstopper. Always make these at the time of serving, they do not keep well and will loose their vigour pretty quickly when kept to one side. ​Whisk all the ingredients vigorously until the crepe batter is completely smooth; allow the batter to rest in the refrigerator for at least 20 minutes before making the crepes. Melt 1 tablespoon butter in a crepe pan or large skillet over low-medium heat. Add 3 tablespoons of batter to the pan and swirl until the bottom of the pan is covered with batter. Cook the crepe for 1 minute, or until the crepe is slightly moist on top and golden underneath. Loosen the edges of the crepe, slide the spatula under it, and then gently flip it upside down into the pan. Cook for 1 minute and transfer the cooked crepe to a plate to keep warm. Repeat the process with the remaining batter. In a large skillet set over medium heat, melt half of the butter until it foams. Remove the skillet from the heat and sprinkle the half the sugar over the melted butter. Add half the Grand Marnier, handling the skillet carefully because of the flame, and then add the crepes to the pan to coat both sides in the orange syrup. Fold the crepes into quarters or roll them into cylinders. Melt the remaining butter in the skillet, remove it from the heat, and then add the sugar and Grand Marnier to make more orange syrup. Place a spoonful of mixed fruit and scoop of ice cream next to each crepe and drizzle the crepe Suzette with the orange syrup.